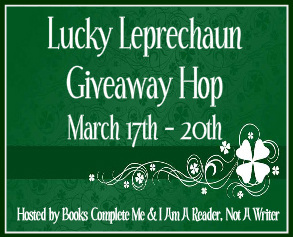 The Book Rat: CLOSED Lucky Leprechaun Blog Hop Giveaway! So you may recall I participated in the Follower Love Blog Hop in February, and I had so much fun doing it that I immediately signed up for the Lucky Leprechaun! There are 250+ blogs participating in this one! I liked the format I used last time, and I think it's a great way to make some room in the prize pool, so I'm going to stick with that. Plus, the pool holds a little something for everyone, so it works out nicely. All you have to do to enter is fill out this form. CONTEST IS NOW CLOSED! I would suggest leaving a comment so you know you entered, but this is purely optional. I may have additional winners, so I would suggest leaving alternate picks in the form. Thank you for the giveaway. Also for the option for overseas readers. This is very appreciated. This is really cool of you. Happy St. Patty's Day! Thanks for the giveaway. I have some problems with my internet connection, so I don't know if I entered twice. If it is the case, please ignore my second entry. I'm sorry, Misty. Thank you so much for the giveaway and a great list you got there, crossing my finger and hope that I could win Monster of Men! My first choices would be one of the Rachel Vincent books. There are others that look so good I'm having a hard time deciding! Thank you for the giveaway! And thanks for making it international! My blog is in the Lucky Leprechaun hop, too. Please visit! I've followed you on Twitter and Liked your page on Facebook. Please follow me (@Suzanne_Adair) and Like my Facebook page. Thanks! I subscribe to you email newsletter. hi, thanks for the great giveaway and more for make it international. So many awesome giveaways on this hop. Thanks for the chance to win!